Microdry Incorporated is a world leader in industrial microwave processing equipment and offers complete electrical and mechanical design capabilities as well as fabrication, machining, and manufacturing abilities. 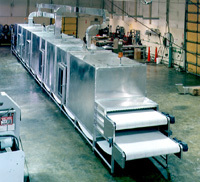 Microdry also has a full service applications laboratory where products can be tested and evaluated on pilot and full scale equipment making Microdry Incorporated the largest and most comprehensive industrial microwave manufacturer in the United States. Microdry’s product testing lab is equipped with 915 MHz and 2450 MHz batch, conveyorized, meander and vacuum microwave systems. It is likely we have case histories on your product or one very similar. If so, we can supply you with information on equipment, capitol cost, operating cost, savings and product suitability. If your application is new, we invite you to visit our 8,000 sq.ft. laboratory where our experienced personnel will endeavor to adapt and develop techniques to make your application a viable one. Microdry has many component parts in stock for immediate shipment including magnetrons, for both 915 and 2,450 MHz, waveguide, directional couplers, three port circulators, waterloads and many other components. We also offer equipment for lease, giving the customer an opportunity to perform in-house application and feasibility studies as well as the opportunity to see first hand how a microwave system can be incorporated into their process. Microdry can perform calibration and repair service on all makes of equipment and accessories. Our systems troubleshooting approach to addressing the cause of downtime with effective actions, eliminates recurring failures by avoiding the “trial and error process” resulting in increased process efficiency.